Torre Mar Galapagos Boutique Suites Hotel is conveniently located in the port town of Puerto Ayora on Santa Cruz Island, Galapagos. Torre Mar Galapagos Boutique Suites Hotel is family owned and operated. We believe in offering quality accommodations where our guests feel at home. Our suites have all the modern conveniences, but we add unique touches that can only be found in the islands. All the furnishings in the suites are custom designed and handcrafted in Galapagos. You can feel the island lifestyle. When you opt to dine at Torre Mar Terrace for breakfast or dinner you will enjoy fresh locally produced seasonal ingredients. You can taste the flavors of the island. A visit to Galapagos can be very active. Our spacious suites are an oasis of comfort during your Galapagos stay. We also believe it is important our guests have the opportunity to experience the local culture. 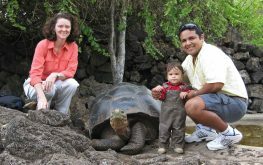 As a guest of Torre Mar Galapagos Suites, you can experience our local community daily.The central location and the attention to detail make your stay at Torre Mar Galapagos Suites a perfect choice for an active family adventure, a fun relaxed tropical vacation with friends, or a romantic getaway. Be our guest at Torre Mar Galapagos. To make reservations please use the reservations page.